You can always count on our passion for helping small-and-medium-size companies grow as we have been over the last decade. The great news is that we have worked with so many diverse companies, that we are confident that we have a firm understanding of what will work for your small business. You can trust us to help grow your business today, tomorrow and far into the future. Review– Consumer decides if they made a good choice. Repurchase– Consumer hires services again. Let's take a look at a real-life example. John has been remodeling his bathroom, and he has decided that some pipes need to be moved. Purchase – You go to John's and do the work. You get paid and leave. Connecting with customers at each step of the buyers funnel ensures that you have less downtime, more repeat customers, and a better chance of customers referring you to friends. 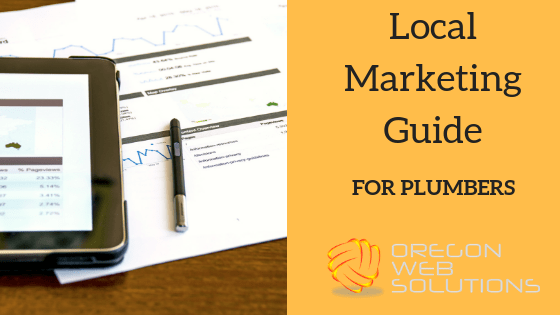 In order for your marketing efforts to be successful, you must recognize what digital marketing facets your clients are using at each part of the loop. Studies show that over 97 percent of customers go online to find a plumber. Pay-per-lead sites and directories: While joining local directories like the local chamber of commerce can pay dividends, we are generally cautious of other pay-per-lead sites. Learn why we caution plumbers about using some of these sites like Angie's List, Yelp, HomeAdvisor and more. Pay-per-click marketing: These programs require you to pay a fee when someone clicks on your ad. They can be highly effective in the right market. Website: Every company should have a website as over 30 percent of customers will not consider using a business that does not have one, and 63 percent of customers prefer this method to first engage with a company. If you operate in different cities, every city should have a dedicated page or website. Each of your services may also need its own page. Social media marketing: Facebook, Twitter, Pinterest, Instagram, and other social media channels can be highly effective through organic posts along with paid ads on some of these platforms. Over 70 percent of consumers expect a company that they are considering to be active on social media. Email marketing: Plumbers can often use emails to raise awareness of their company, solicit reviews and for other reasons. Video marketing: Showing customers how to do simple plumbing tasks like unclogging a toilet or turning off the main water until you arrive can be effective. Video marketing will soon be over 80 percent of content marketing. Recruitment marketing: Let us show you how to attract the best employees through your online presence. Customer service: Harness the power of great customer service to grow your company. Reviews: With over 85 percent of customers trusting online reviews as much as they do if a personal friend made the recommendation, let us show you the power of reviews. Over 93 percent of customers turn to the internet when they are looking for a plumber. Most never go beyond the first page when using a search engine. Let us show you how to have your company found there even if it's not your website. Local Paks: While Google chooses who gets to appear in this listing of three companies, there is very little doubt that the company with the most positive reviews stands a better chance. Google may also include Google Ad listing in these lists. Google Ad Listings: Your paid ad can appear above or below organic listings as long as Google finds it relevant to the user's search engine ranking. Google My Business: If a potential customer enters your business name into the search engine, then this box will appear. It contains your address, your phone number and other details. It also offers users the chance to see your Google reviews. Do You Own A Plumbing Business And Need Help? Local Marketing Guide For Plumbers	Overall rating:	5	out of 5 based on 48	reviews.